The 1923 season has completed. Hot off their '22 title, the Maquoketa Bears skyrocketed to first place with 42 wins. The Dubuque Dubs tied with the Bears with 42 wins, but didn't own the tiebreaker. Expansion team Cedar Rapids Rabbits took advantage of their incredible depth and finished with 38 wins for third place. 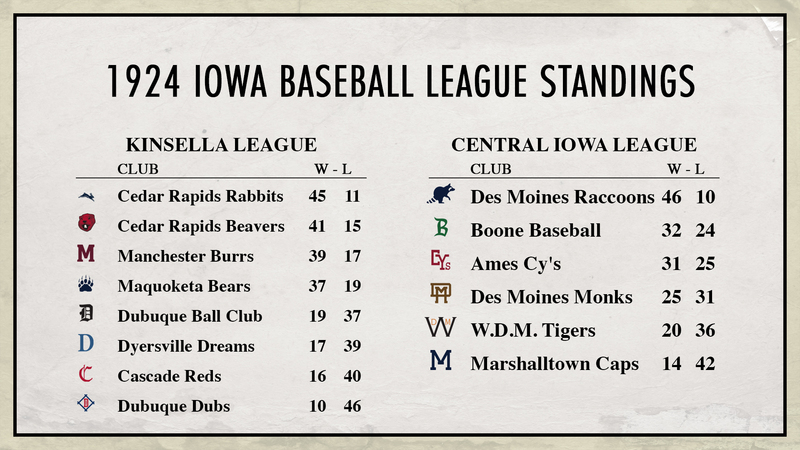 The Dubuque Ball Club and the Cascade Reds rolled into 4th and 5th place respectively. The Manchester Burrs and Dyersville Dreams tied for last place with 14 wins. The Burrs held the tiebreaker. 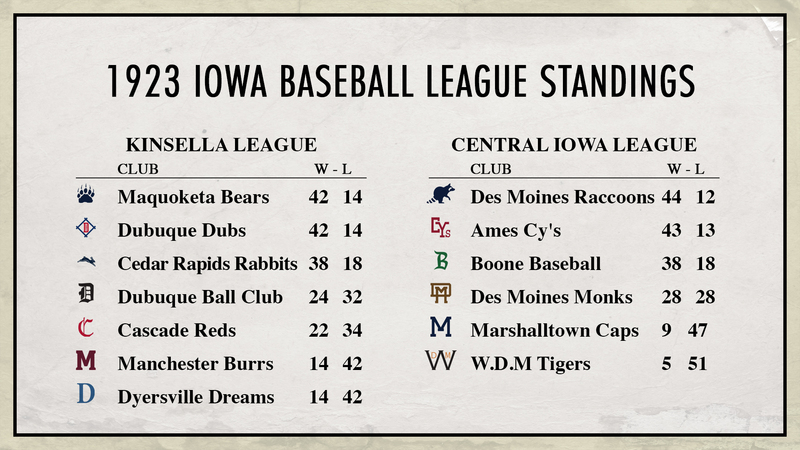 The Des Moines Raccoons, one of the most consistent IABL teams in its young history, finally clinched their first Central Iowa League regular season title with 44 wins. The Ames Cy's finished just behind them by one win. Boone Baseball took third place, while the Des Moines Monks recorded a .500 season. The league was very top heavy, as the top four teams beat up on the small-town teams in the Marshalltown Caps and the West Des Moines Tigers. With the addition of Cedar Rapids, the Kinsella side of the bracket now has seven teams with the regular season champions receiving a bye. There weren't any major upsets, except for the Dubuque Ball Club taking down no. 1 Maquoketa. Over in the Central Iowa League, their format remained the same with six teams and top two teams getting byes. In the first round, Marshalltown and West Des Moines pulled off two incredible upsets by defeating the heavily favored Monks and Boone respectively. However, in the quarterfinals, the Raccoons and Cy's advanced to the semi-finals as expected. In a hard fought battle, the Cy's advanced past the Raccoons in hopes of winning their second Kinsella title. 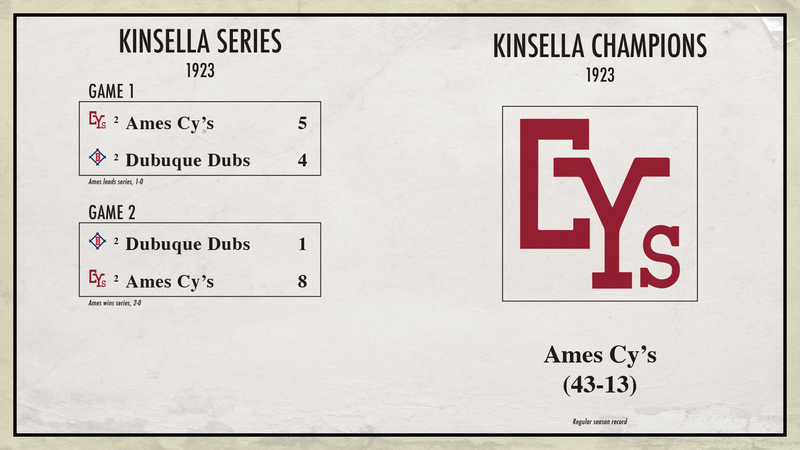 Game 1: In an exciting conclusion to Game 1 of the 1923 Kinsella Series, the game was tied 4-4 until the top of the ninth inning, where a Cy hit an inside-the-park home run to give them a 5-4 lead, which they would hold to clinch the win. Game 2: It was over in a hurry. A two-run triple and a sacrifice fly made it 3-0 in the first inning. Then the Cy’s got four more runs in the second inning thanks to a three-run inside-the-park delivering the big blow to the Dubs. The Cy’s starting pitcher surrendered just one run three hits in a complete game effort. The Cy’s picked up their second Kinsella Series title, becoming the first team in the IABL to win multiple titles. With the overall success of the IABL and how well the Cedar Rapids Rabbits did in their inaugural season, the league awarded a second team in Cedar Rapids, the Cedar Rapids Beavers. Due to the incredible depth the Rabbits had and more than half of the team wanting more chance to play, they petitioned to split off and form their own team on the other side of the Cedar River in Cedar Rapids. The team went with the Beavers due to the decent beaver population along the Cedar River, and they'll be playing in the Bever Park. 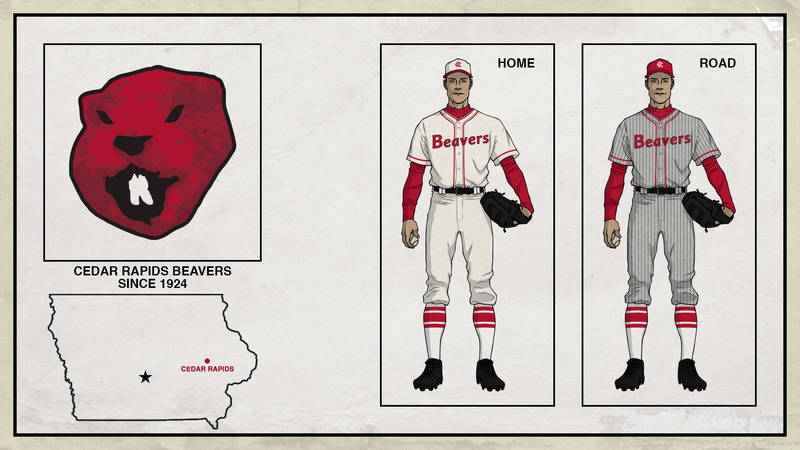 * To contrast with the blue Rabbits, the Beavers will be primarily a red team. 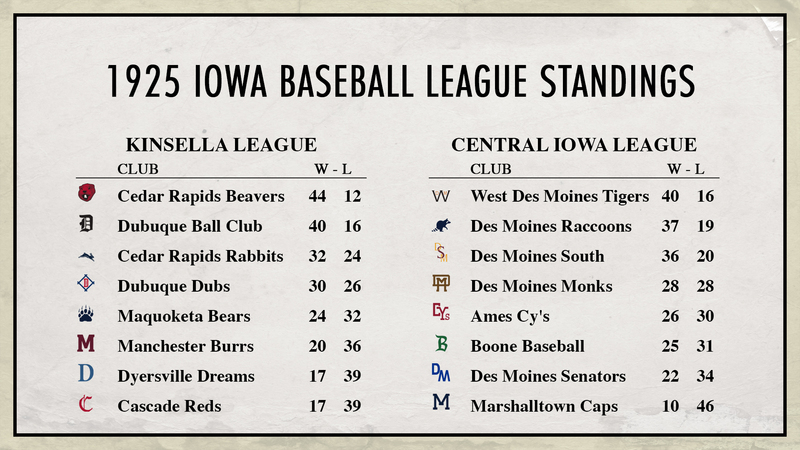 The Kinsella League will now have eight teams, while the Central Iowa League remains at six. Can't wait for the Rabbits-Beavers rivalry! Any trophy ideas? Yes, I know that Beaver logo may seem horrifying. But tell me this doesn't look horrifying too! 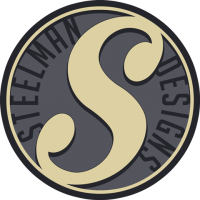 I designed the logo that way on purpose, in hopes of refining it and improve it over time. * - There is actually a Bever Park in Cedar Rapids, but I have no idea when it was founded. But when I browsed around on google maps in Cedar Rapids, I came across this park and decided to name the team after them. At first I thought it read Beavers, but it didn't, so oh well! For a trophy, have a local businessman give them a boat on the river, and the winning team's players get access to it for 1 year. The business would plaster the side with the business name (for advertisement), and the boat would be names after that business. That beavers road may be the best jersey yet! The 1924 season has concluded. To nobody's surprise, the two Cedar Rapids were above and beyond any other teams, as the Rabbits and Beavers finished 1-2 in the league. The Manchester Burrs and Maquoketa Bears followed them in the 3-4. The top half of the league were in a clear tier of their own, while the rest of the league had a losing record between 10 and 19 wins. The top three teams didn't change much from the '23 season, except for the Ames Cy's and Boone Baseball switching positions. The Des Moines Monks rolled into fourth. Despite holding a losing record every single season, the West Des Moines Tigers are still afloat due to the affluent community in their region. The Caps capped off the league with just 14 wins. Due to the expansion to the IABL, the Central Iowa League has decided to host their own "playoffs" in at the Iowa State Fairgrounds in Des Moines, a neutral location for whenever the Des Moines Raccoons and Des Moines Monks face each other. (The Raccoons and Monks have their own home fields). The Kinsella League will continue to hold their own playoffs at the Field of Dreams in Dyersville. The Kinsella Series will still be at the Field of Dreams. In the top half of the bracket, the higher-seeded teams advanced without any surprises. However, there were two upsets as #6 Dyersville dropped #3 Manchester while #7 Cascade defeated the newcomers in #2 CR Beavers. 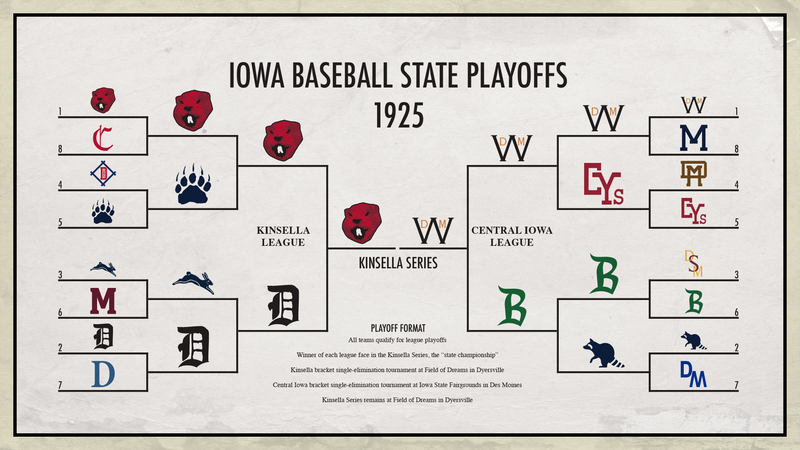 In the Kinsella semi-finals (IABL quarterfinals), the Rabbits took care of the Bears while the "higher-seeded" Dreams handled the Reds. In the finals, the Rabbits easily crushed the Dreams to advance to the Kinsella Series. 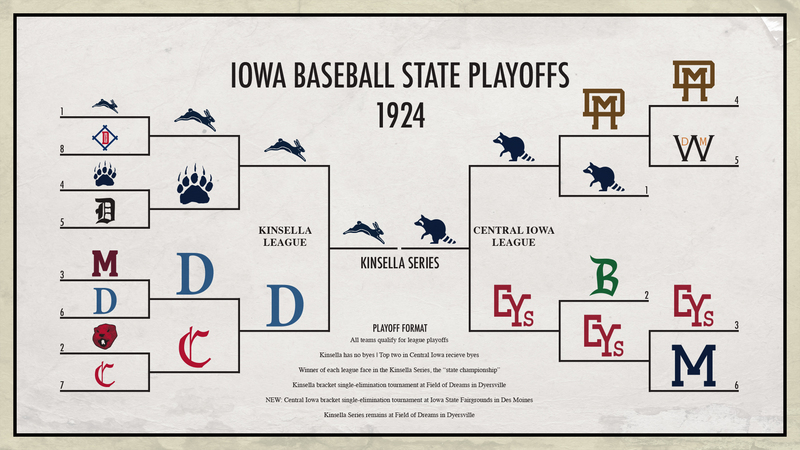 In a small oddity, the league's two brackets were divided into the "Des Moines area" with the Raccoons, Monks, and Tigers in one half, while the Cy's, Caps, and Boone were bundled up in the other half. No upsets were made in the first round as everybody advanced as expected. In the IABL quarterfinals, the Raccoons took care of their cross-town rivals while the Cy's defeated their rivals in front of the largest IABL crowd recorded, as the games were played on the Iowa State Fairgrounds DURING the Iowa State Fair. 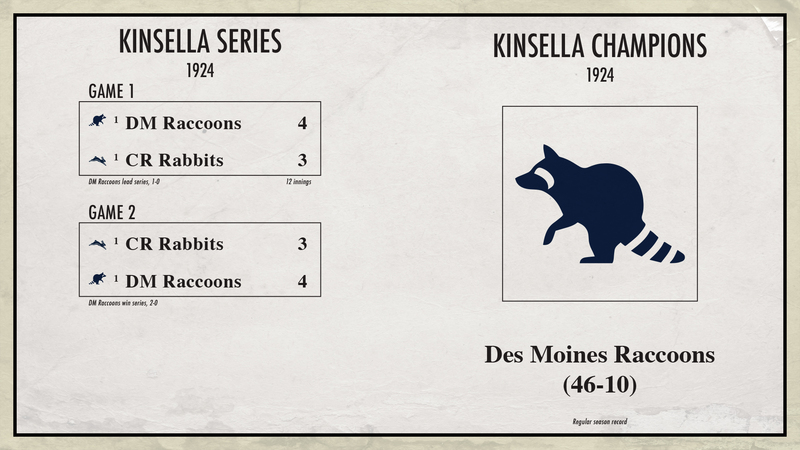 In the Central Iowa finals, the Raccoons defeated the Cy's to advance to their first Kinsella Series. Game 1: The Rabbits tied it at 2–2 with a run in the bottom of the ninth. The Raccoons scored two in the top of the 12th off the Rabbits’ ace to take the lead. Cedar Rapids fought back for a run in the bottom of the 12th, but left the tying run on third. The Raccoons lead the series, 1-0. Game 2: Des Moines got things going early by scoring three runs in five innings. But the Rabbits would quickly fight back in the final three frames to tie the game as it went to the bottom of the ninth. With a pinch-runner representing the potential winning run on first base and one out, the Raccoons hit a walk-off double to win the game and the 1924 Kinsella Series. Nice to see some improvement from my Boone Railroaders (I know it's not the team name, but... it's not like they have something else!). As such, has there been any talks of them getting a team name? When I started up this league, I originally had them named the Boone Trappers in homage to Daniel Boone, but it just didn't feel right because it wasn't like he actually came through the area. I then went with the Boone Ball Club, but it didn't sit well with me either. Then I went with Boone Baseball and for some reason it just sounds good to me, and it somehow rolls off the tongue. I wouldn't mind using a railroad theme but it can be challenge coming up with a name within that theme that would feel right. I mean, the Trains, Express, Railroaders, etc. all could work but I'm whatever about them. They'll probably eventually get a real name at some point. Just not sure when that will be. 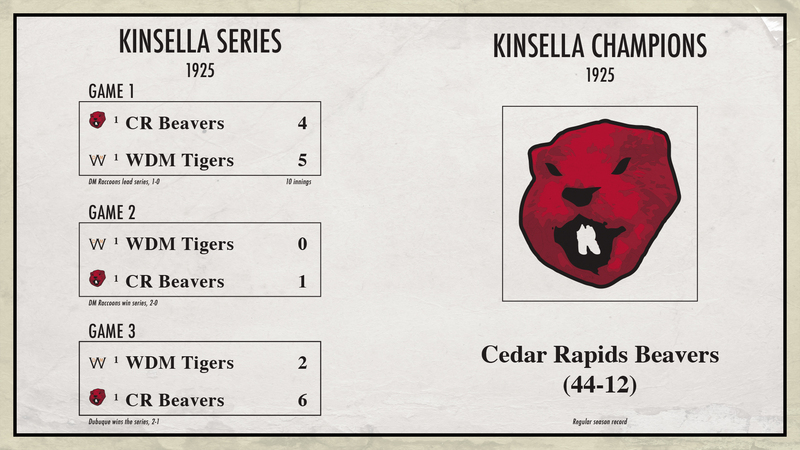 Due to the rapid expansion in the Kinsella League by adding the two Cedar Rapids teams over the past two years, the Central Iowa League decided to play catch up with them and add two Des Moines teams of their own to the league prior to the 1925 season. With Des Moines being the largest city in the state and the two new high schools opening, the time to expand in the league was ideal for them. Both leagues now have eight teams apiece. The first new team is called the Des Moines Senators, in honor of the Washington Senators wining the World Series in 1924. They borrowed the Washington's W logo and turned it around upside down to make it an M for "Moines" in the logo. 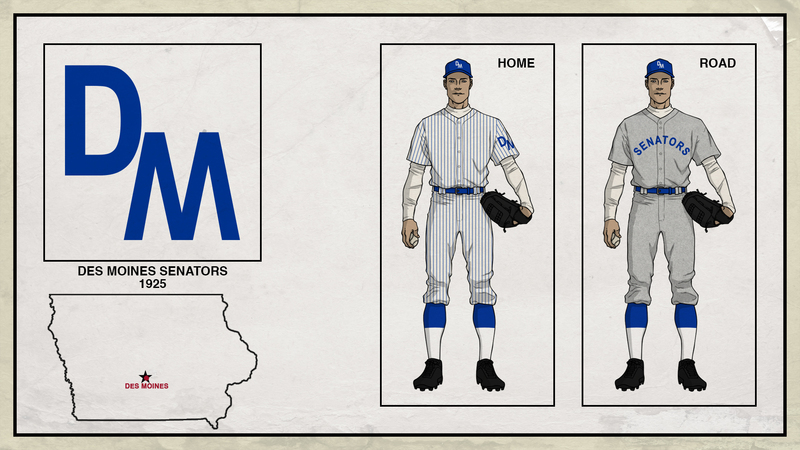 Plus, with Des Moines as the capital city of Iowa, the name Senators fit. A second team has been added to the south side of Des Moines, near the new high school that just opened there. Borrowing their color scheme, the team will be maroon and gold and be dubbed Des Moines South. 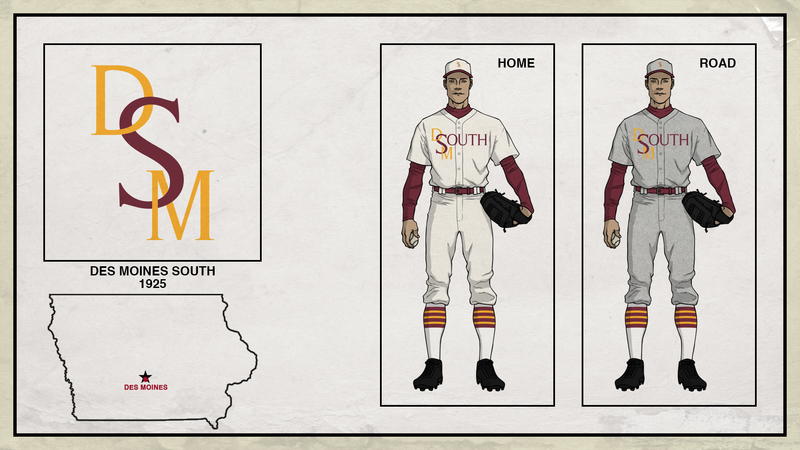 The team couldn't decide on a nickname, but elected to go with community pride as being the "South Side" team in Des Moines. Their main logo is a DSM monogram, which is also the airport code for Des Moines, which also happens to be on the south side of Des Moines as well. The team will play on the schoolyards of the new high school, but not directly on their baseball field per league policy. P.S. The Des Moines airport actually didn't open until the 30's. So when the time comes, it's likely that Des Moines South will change their name to reflect the airport. Des Moines Pilots? I like that Rabbits logo, nice work. The Beavers look good. That logo is, uh, something else indeed. Ha. The 1925 season has been completed. With a year of experience under their belt, the Beavers were able to win the league regular season title easily. The Dubuque Ball Club shot up the standings from fifth place to second place. The Rabbits struggled a little bit, but still finished strong with third place. The Dubs have been yo-yoing the last few years and ended up in fourth. Maquoketa and Manchester rolled into 5th and 6th, while Dyersville and Cascade tied for seventh and last place. With two new teams in the league, there were quite a shakeup. Thanks to brand new facilities, new coaching staff, and two hotshot players, the West Des Moines Tigers recorded their first ever winning season with 40 wins and a regular season title as well. The Des Moines Raccoons seem to have a new rivalry with the Des Moines South, as they finished in 2-3 with just one win apart between them. The Des Moines Monks finished with a mediocre season at .500. Ames, Boone, and the new Des Moines Senators all finished with wins in the 20's. The Marshalltown Caps continue their struggles as they've averaged just 11 wins the past three years. There has been talks about folding, but the sense of baseball pride is so strong in the community. In this side of the playoff brackets, there weren't any surprises. The only upset came when the #5 Maquoketa Bears defeated the #4 Dubuque Dubs, but even then, that was barely an upset. The #1 Cedar Rapids Beavers, however, are on a torrid streak, as they won by a combined score of 21-6 to easily advance to the Kinsella Series. 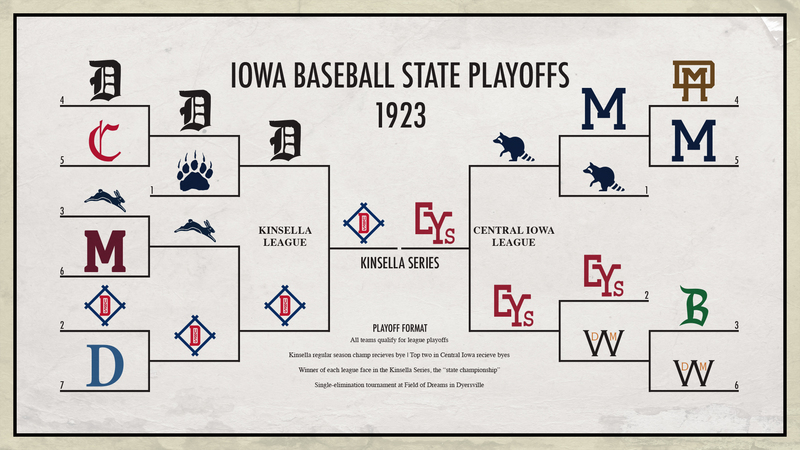 With the newfound success from the West Des Moines Tigers, they were able to roll their way through the Central Iowa teams all the way to the Kinsella Series. The Ames Cy's and Boone Baseball seem to have a knack for putting together solid runs in the postseason, as they won their first rounds as the underdogs. 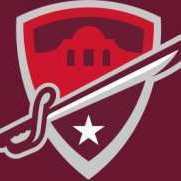 The two expansion teams, the Des Moines South and Des Moines Senators, weren't able to do anything due to their inexperience. Game 1: There was a lot of late action in Game 1 of the Kinsella Series. After the Tigers got out to an early 4-0 lead in the first inning, the Beavers chipped away and tied the game in the top of the ninth inning with two runs scoring on a wild pitch and a seeing-eye single. In the top of the 10th inning, the Beavers took the lead on a solo homer. However, the Tigers responded with two-run, walk-off double in the bottom of the 10th inning to win the game, 5-4, and take the series lead. Game 2: In game 2, the Beavers ace fired a complete game to shut out the Tigers, 1-0, to tie the series. The lone run of the game was a solo homer in the seventh inning. Game 3: In a winner-takes-all game, Game 3 was a nail-biter until the eighth inning, when the Tigers tied the game at 2-2. However, the Beavers came back with a four-run rally of their own in the bottom of the eighth inning. The Beavers ace, who tossed a shutout yesterday, came in the ninth inning to slam the door to clinch the Kinsella Series with a 6-2 victory. In the Beavers’ second year of existence, they won their first Kinsella Series title.